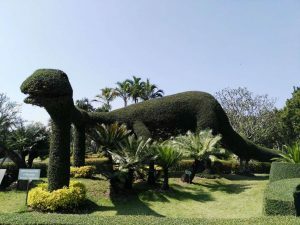 Tweechol Botanic Garden – Founded in 1997 it is one of the most beautiful Gardens in Chiang Mai. The Garden is only 30minutes away from the centre of Chiang Mai. It is just a straight drive northeast on the way to Doi Saket. There you will find one of the largest collections of plants in Thailand which have been collected for years and it covers an area of 114 acres. This is the perfect location for a day trip with your family, as a couple, or with a few nice friends out off the beaten track. It has different gardens with Palms, Herbs, Roses and Cyclades so you can view the amazing variety of each. And it is also a wonderful place to relax and wander but i recommend to renting a bicycle. And if you’d like to explore on water, you can rent a paddle boats for a spin on the lake with your children or loved ones for only 50 bath. Among the many delights of Tweechol Botanic Garden is an outstanding display of topiary in the shape of birds and animals. It also hosts the Huen Chaiharn Museum that displays images of Buddha, weapons and many other antiques, old Lanna-style wooden houses, a huge swimming pool, a mini zoo with a lots of small animals that children will love to see and a lake front restaurant. The Orchids, Cacti and Antirrhinums are housed in 4 large buildings. Because of the care that goes into the gardens, pets are not allowed to join you, and you should keep in mind that there are hotel guests staying on the property.